The FTSE 100 Price is currently 6,484 which is a gain of 2.1% on the 01 February 2013 Price of 6,347 and 9.3% above the 01 March 2012 Price of 5,931. The FTSE 100 Dividend Yield is currently 3.42% which is down against the 01 February 2013 yield of 3.47%. The FTSE 100 Price to Earnings (P/E) Ratio is currently 14.44. The Price and the P/E Ratio allows us to calculate the FTSE 100 As Reported Earnings (which are the last reported year’s earnings and are made up of the sum of the latest two half years earnings) as 449. They are down 13.0% month on month and down a large 23.9% year on year. The Earnings Yield is therefore 6.9%. So we find ourselves in a continuation of the interesting situation that I highlighted last month. Nominal Earnings are falling off a cliff and have been consistently falling since October 2011’s Earnings of 628. They are now down 28.5% since then yet in comparison Prices are increasing. Nominal Prices are up 27.7% over the same period. 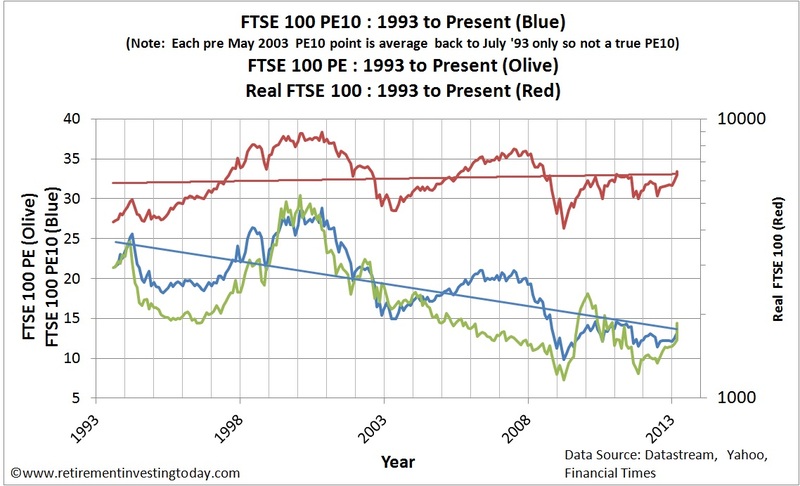 The first chart below provides a historic view of the Real (CPI adjusted) FTSE 100 Price and the Real FTSE 100 P/E. Look at the trend line of the Real Price. After you strip out the effects of inflation the perceived market value is doing not much more than oscillating above and below a flat line which we are now sitting on. 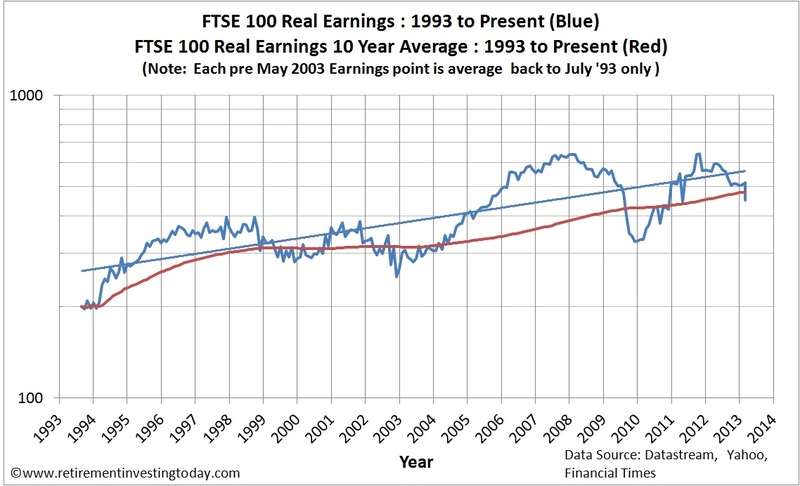 The second chart provides a historic view of the Real Earnings along with a rolling Real 10 Year Earnings Average for the FTSE 100. FTSE 100 PE10 is 13.5 which is up against the 01 February 2013 PE10 of 13.2. The FTSE 100 Average PE10 is 19.1. Assuming this is “fair value” it indicates that the FTSE 100 is 29% undervalued. As I always say I don’t actually believe this and think that this is a function of the fact that the dataset is quite short but more on this later. The correlation between the FTSE 100 Price and the FTSE 100 PE10 is 0.21. This is considered a weak or low correlation. The correlation between the FTSE 100 Real Price and the FTSE 100 PE10 is a much more impressive 0.66. This is considered a moderate correlation bordering on a strong or high correlation. The chart below is why I use the FTSE 100 CAPE to drive a tactical portion of my Retirement Investing Today asset allocation. 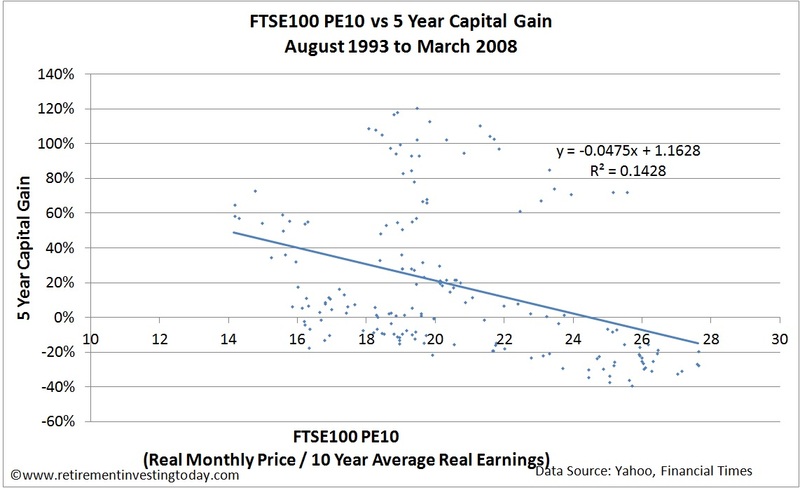 It shows the relationship between the FTSE 100 PE10 and the Nominal 5 Year Capital Gains from August 1993 to March 2008. Ideally this would be a 5 Year Total Return Chart, ie including dividends, however this dataset is not yet mature enough to allow this given my dividend data only goes back to 2006. Even so just looking at 5 Year Nominal Capital Gains we see a correlation of -0.46 with an R^2 of 0.15 which is considered moderate. With the FTSE 100 PE10 at 13.1 the trendline suggests a future Nominal 5 Year Capital Gain of 52%. In contrast the Real (inflation adjusted) 5 Year Capital Gain (not charted today) trendline implies a return of 35%. While I am making investment decisions from this FTSE 100 CAPE data I have a problem in that the dataset is quite short. To correct for this I make a large assumption which is that there is a high level of correlation between UK Equities and International Equities. Tim Hale in his excellent book Smarter Investing: Simpler Decisions for Better Results shows a table which suggests this correlation could be as high as 0.9 which is a very strong correlation. Therefore if I look at my mature S&P 500 dataset it shows that from 1881 to present we have seen an average PE10 of 16.5 and from 1993 to present (the length of my FTSE 100 dataset) we have seen a much higher average PE10 of 26.4. If I ratio these two numbers and multiply by the PE10 Average from my FTSE 100 dataset I can get a pseudo “long run” Historic FTSE 100 PE10. Doing the maths this is (16.5/26.4)x19.1=11.9. Comparing that number with today’s PE10 of 13.5 suggests a 13% over valuation compared with the 29% undervaluation presented earlier. It is this relationship that I am basing my own personal investment decisions on and so with the market continuing to become slightly over valued I am being forced to lighten up and am now targeting an allocation of 19.1% of total assets towards UK Equities as my tactical allocation compared with a nominal strategic allocation of 20% of total assets. UK CPI inflation data for February and March 2013 is estimated. Thanks for this. I don't understand how you can adjust a ratio for inflation. Both the price of the shares, the numerator, and their earnings, the denominator, are stated in the same pound values. Could you please explain? In the case of PE at a given point in time, clearly the value of the pound at that time is immaterial. He's only used inflation measures when calculating CAPE, as it takes average earnings over the previous ten years (if data is available for that long). In order to compare the real value of those earnings to the price, he's eliminated the effects of inflation over that ten year period. Thanks for the useful information. I've tried in the past to find the historic foreign earnings data for a reasonable price but have not had any luck. Did you get this information from Datastream or directly from FTSE?